In this quick tutorial you'll learn how to draw a Birdwing Butterfly in 5 easy steps - great for kids and novice artists. At the bottom you can read some interesting facts about the Birdwing Butterfly. 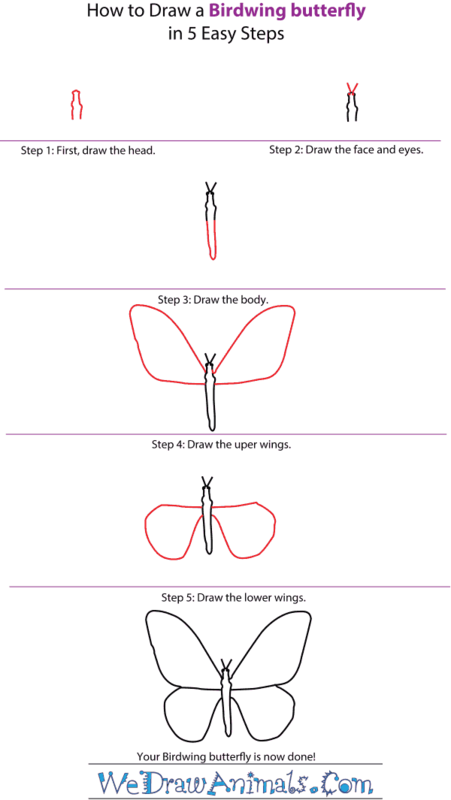 Step 1: Drawing a butterfly is easy! Start by drawing a curved line for the head. 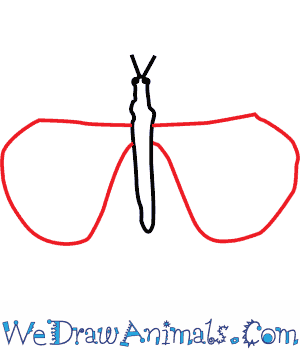 Step 2: Let your butterfly see by drawing two small spheres on each side of the butterfly's head. Draw two short lines that stretch away from one another to create the antennae of your butterfly so that it can easily find delicious flowers. 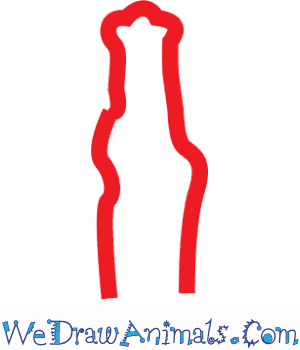 Step 3: Now draw the body which is a line that curves in the opposite direction of your first line. Don't worry if your lines aren't perfectly straight. The body of a butterfly often bends and curves in many ways. Step 4: Butterflies have four wings. 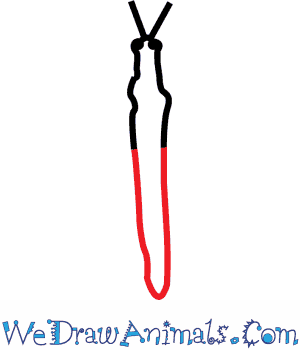 In this step, you'll draw the two large upper wings. 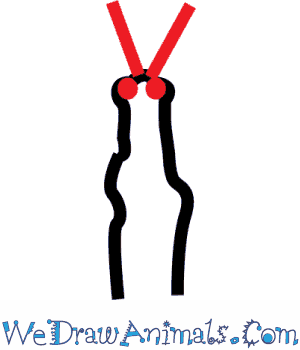 Draw two lines that extend out from the upper part of the body then curve up and bend back down to below where the eyes are located on the head. 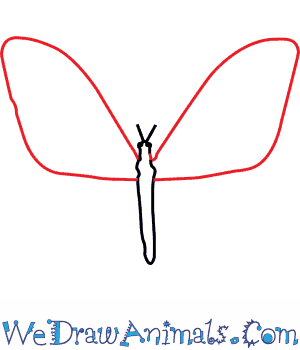 Step 5: Draw the two lower wings by drawing circular shapes that bend down and away from the upper wings. Make sure the bottom lines of the upper wings are attached to the top parts of the lower wings. Now that your butterfly is done, bring it to life by adding unique colors and patterns. Southern tailed birdwing butterflies are beautiful green-colored butterflies commonly found in primary and secondary rainforest areas mainly in Eastern Papua New Guinea and Irian Jaya, Indonesia. The wing size of a male birdwing butterfly is 80-115mm and has black, green-yellow, golden markings on it whereas females have black, white and yellow spots on them. Lizards, frogs and birds are the common predators found to attack the larvae. They feed on flowers early in the morning. They are listed as endangered species. In 1980, a pair of butterflies was sold for £650 in Britain. Males have a smaller wing size compared to their body whereas females have a larger proportionate wing size in terms of their body. The major cause of extinction of birdwing butterfly is loss of their habitat. 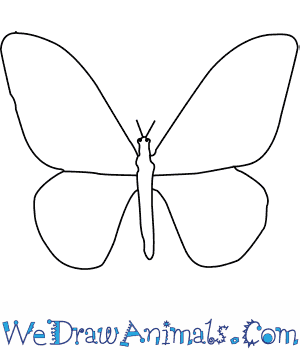 Lesson plan note: Help children draw butterflies! Let them make different shapes of wings, add colors, have different patterns and decorations. You can then paste them all on a wall and have a beautiful wall or hang these multi-colored butterflies from the ceiling. This will lead to the creation of a beautiful butterflies hanging garden!